General Description: Castello Bianco is located 500 m from a sandy beach. 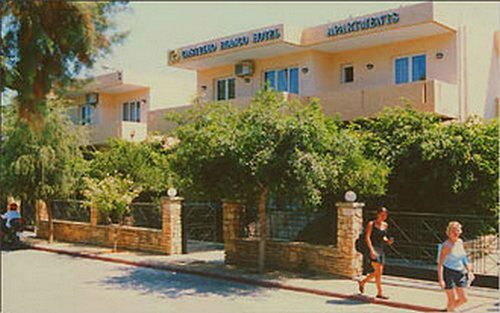 The closest city to the hotel is rethymno (5 km). Other cities: chania (45 km). To make your stay more comfortable a lounge, a lobby, air conditioning and a reception are available. The staff in this hotel speaks Italian, German, English and French. The hotel features a swimming pool, seasonally open. Sunshades and sunbeds are available for an additional fee at the beach and at the pool. Distance from the hotel to: airport HER (79 km). The hotel is within easy reach of tourist information, supermarkets, bars and restaurants and city centre. Vehicles may be parked in the parking lot. Amenities: For convenience the hotel offers wake-up service and a safe. Internet access is provided at wifi-hotspots. Reception hours: 08:00 - 00:00. Meals: The breakfast type is Continental. A snack bar is also available throughout the day.